Create a beautiful entryway to your home's landscaping with one of Country Craft wooden Arbors. Whether you are looking to make a statement with the entrance way, create a focal point in your yard or make a cozy sitting area in your garden there's no need to look any further. Covered in fragrant Roses the T-5 Arbor would make an aromatic entryway or covered in dense Ivy a private getaway right in your own backyard. 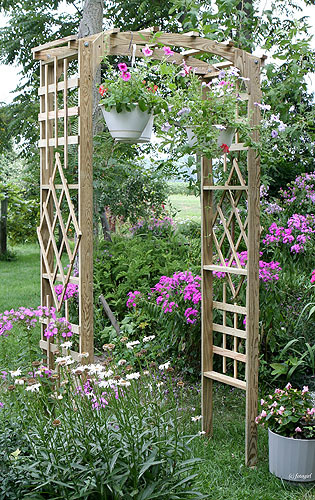 Our standard T-5 Narrow Arbor stands 7 foot tall is 18" deep and has a 3 foot walk through. If this isn't the size you are looking for we do specialize in custom sizes to fit your needs. 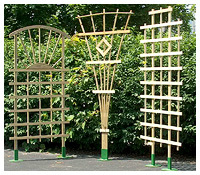 Please contact us for Arbor sizes and prices.